Susan Masino - "Let There Be Rock"
„Let There Be Rock“ is the definite story of AC/DCs long lasting advancement into the stratospheres of Rock’n’Roll. In this book, the reader learns about the story of a bunch of friends in Australia who become one of the most veritable and legendary bands in rock history. Susan Masino has followed the trail of AC/DCs early days in the 70es in Sydney, Australia, blistering tours through the USA up to the tragic death of Bon Scott. Surprisingly, the story of AC/DC was not over then. Brian Johnson was and still is a more than worthy representative, who made the band even more succesful and let them advance to top positions in the charts. “Back In Black” became one of the most important albums in rock history, and even in the 21st century the band still is a guarantor for sell-out crowds. The music journalist Susan Masino has intensely been following the career of AC/DC since the late 70s. The book is based on numerous personal interviews and memories as well as on red-hot interviews with musicians and friends. 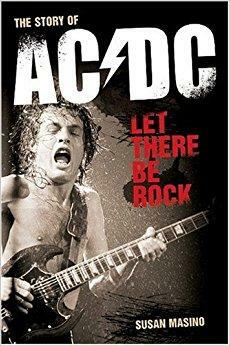 In this book, the true story of AC/DC is revealed – honest and exciting, as it has taken place.